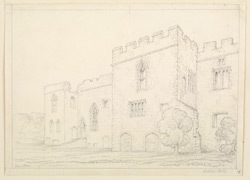 Drawing of the North Range of Ludlow Castle in Shropshire. This section of the castle is of a later date, and has domestic buildings such as the Central Hall, Solar wing, kitchens, Tudor lodgings. During the16th and 17th century Ludlow was important as a royal residence and was a centre for the administration of the Marches (border area between England and Wales). As such it was heavily refurbished and the accommodation was improved, particularly in the late 16th century.